Click the arrow on icon above to hear this powerful show. Thirty Billion years ago, McGehee writes, a positronium in our neighborhood of the early universe destabilized. 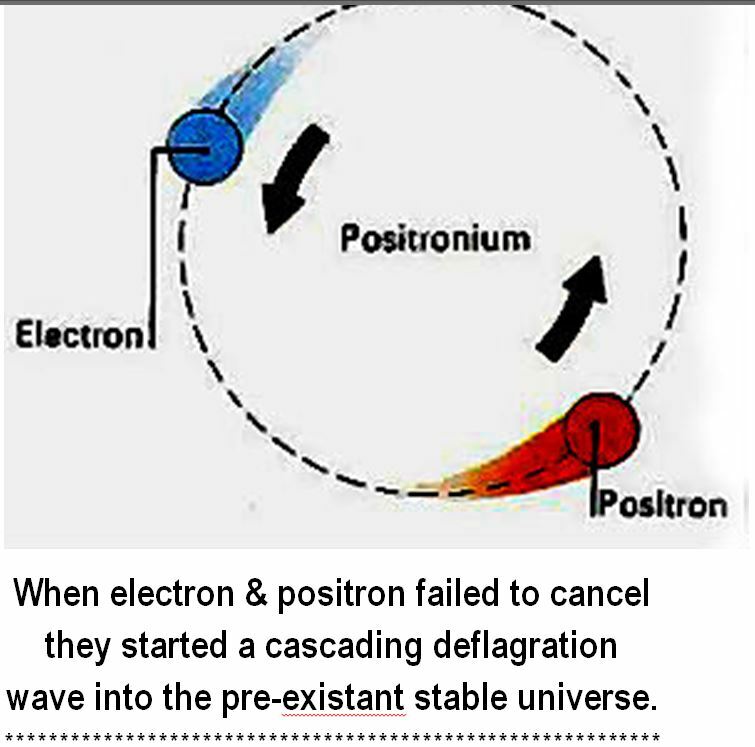 Positroniums ordinarily form and cancel out less than a second after releasing two photons in opposite directions. Our universe–and there’s probably others–is an infinite ocean of particles, a mixture of electrons and holes which are the antiparticle of the electron and the positrons that equal electrons in mass that account for the eight times more dark than light matter in the universe. In the wave and after it, photons made matter that moved at speeds that gravity made into clumps. As the particle clumps grew and hit each other, the collisions knocked them from their straight line movement into angular movement. Farrell notes in support of this notion, that as the clumps grew, they moved ever slower from where the first positronium set them off. “Gas and particles behind the deflagration wave collapsed into sites of higher gravitation,” creating stars” which in turn formed galaxies older than the galaxies they circled. Thus, globular clusters rounding the Milky Way “are billions of years older than the oldest stars in the Milky Way.” We only see “objects whose light has traveled long enough to reach us.” Since then,”the wave has propagated farther away.” [Farrell, 2012: 89-91].